Kris and I hit the 2nd Annual IPA Brewer's Fest at Blitz on Saturday, mainly because it was a beer event. I mean, what's not to like about an event featuring 13 IPAs...aside from the raging heartburn afterwards, that is? We're generally not drawn towards live-music events and, while we both enjoy BBQ, beer trumps all. And if we're at an event featuring beer, live music and BBQ, the live music almost always ends up being the least enjoyable part of it. It isn't that we may not like the music, bur rather the live music is usually too loud to enjoy and prevents any other conversation. If the music were fantastic, we're more forgiving of the volume. But on Saturday, I think the music trumped the beer and BBQ. I gotta admit, I never thought that someone banging away on a typewriter would be considered enjoyable music. If fact, if you asked me if I wanted to see a band featuring a typewriter as a percussion instrument, I probably would have declined unless it were the Blue Man Group or something similar. After Saturday, however, I'm of a different mind. The second show of the day was Sneakin' Out. It's a small, three-man band that played covers and medley's of songs with an unusual set of instruments, including a typewriter, a mandolin (I guess) and an acoustic bass. The music was lively and, in most cases, very familiar to most of the crowd. It was interesting to have an arrangement of ABBA and Black Sabbath mixed together and played in a frenetic, but interesting fashion. Kris and I will certainly go out of our way to catch more shows. If you get a chance, I recommend checking out this unique act. With less than two months as Portland residents there are still many, many beers to drink and many, many places to drink at that still need to be checked out. That being said, one place made a great impression upon us when we checked it out last week: Green Dragon. This is a newer Portland establishment, at least in terms of it being a Rogue-owned property. With somewhere around 40 tap lines there’s no shortage of great beer to choose from and this week the choices got even better with the debut of their onsite brewery, Buckman Village. Last night was the grand opening for the brewery and with it being a short drive away, off I went to see how their first beer would stack up. The staff was eager to make sure everyone that came in got to try the beers. Yes, plural. Instead of the one beer, Chamomellow, that at least in terms of name didn’t intrigue me too much, there were three offerings which included an IPA and a ginger beer. While the set may have been similar in color, their flavors were strikingly different from one another. The Chamomellow, as expected, was heavy on the chamomile aroma with some upfront honey flavor. The Ginger reminded me very much of Lefthand’s JuJu Ginger, which for me was a very good thing. Finally, the IPA fell on the sweeter end of IPAs but neither the hoppy nor sweet characteristics were lingering, making it a very easy drinker. After my first taste of each I fully expected to end up with a pint of IPA in front of me. 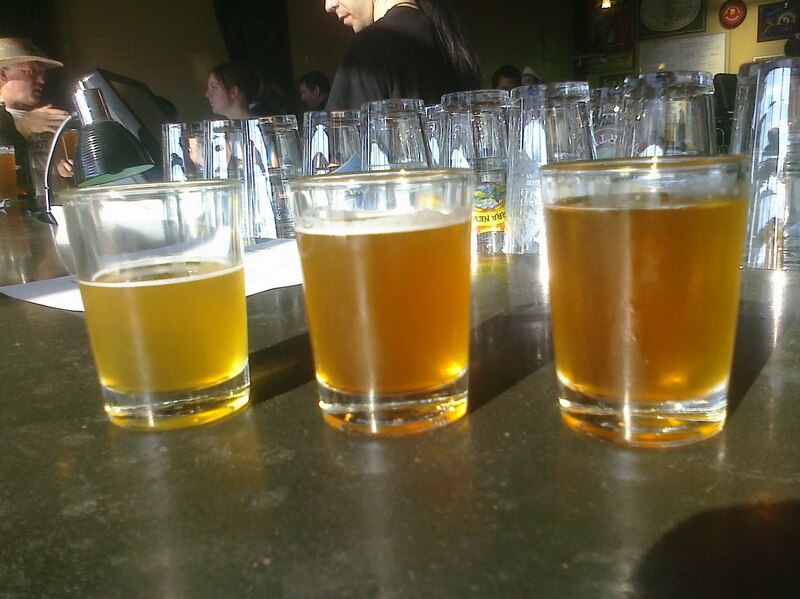 But after making my way back for second and third tastes, and the beers warming up, the Chamomellow really grew on me. The honey flavor became more assertive and the beer very smooth and I was powerless to do anything but order a pint of it. All three beers were very drinkable (although I’d really love to be able to have the Ginger with some sushi) and being in the 6-ish ABV range, easy to enjoy a few of. As far as I’m concerned, Buckman is off to a great start. Such a great start that I might have to return tonight as the carrot being dangled is that they’ll have a firkin. Hmmm…will it be the Chamomellow? Something new? It’s probably important for me to investigate so I can report back. Since our relocation we’ve been talking and looking, albeit not too hard, for an everyday drinking beer. In Minnesota that probably would have been Summit EPA, maybe Coffee Bender for me. So far it seems like the Portland equivalent of Summit is Deschutes and while I’m A-OK with that, I don't want to be complacent with the first thing that pops up so I have been continuing to look around for another label that’s widely available and has something up my alley. Today I may have found a pretty good contender, one with enough hops and flavor to keep me coming back for more but without the brutal hop punch that is enjoyable but can be palate fatiguing. Generally you won’t find me buying New Belgium beer. First of all, the majority of their products don’t interest me very much due to the style. (For the record, I think 1554 is a great black ale, full of the chocolately malts I love.) Secondly, I don’t think Fat Tire is a very good beer, but everyone who thinks they have just discovered the greatest thing since sliced bread thinks it’s AWESOME. That type of fan boy behavior just irritates me. Consumer behavior should not influence my view of a brewery but I’ll admit in this case it does. Back to the story at hand and finding a good go to beer. Tonight as I opened the beer fridge I found some good stuff in there but not what I was searching for; not an EPA or Coffee Bender to be found. Feeling lazy and also curious to see what the 7-11 had to offer I wandered down the street. I wasn’t surprised to find their selection wasn’t very broad, although it did include the aforementioned Deschutes. Looking to branch out I decided to take a chance on New Belgium and the Ranger IPA that has been dominating their marketing for the last few months. I haven’t been able or even willing to answer the question, “What is your favorite beer?” for years. But for the last year or so I could give an answer to, “What is your favorite style of beer?” Hands down I would say IPA: double, imperial, the hoppier the better. But lately I have a new infatuation - sour beers. I’ve been a fan of the Duchess for quite a while, but I don’t really consider her a sour. There’s a bit too much sweet and not enough tart for her to actually be considered a sour in my book. But I suppose she must be given credit for leading the charge on my taste buds, pushing me in the right direction. Since having been in Oregon, I've a wonderful sour blend at Upright Brewing and a Summer Gose from Cascade Brewing while attending the Oregon Brewers Festival. Just this week, in part to show the McG’s around our new home, we went made a maiden voyage to Cascade Brewing and made a return visit to Upright Brewing. Cascade currently calls the Raccoon Lodge in SW Portland home (soon to be opening a much anticipated barrel room) and when we stopped in they were offering up somewhere around ten beers, of which nearly half of them were sour. Their Summer Gose caught my eye right away, but having already tasted it, I gave the Winter Gose a try. It was a good beer, with the spice notes being more subtle than I feared and the sour notes more pronounced than I had expected. But I was eager to return to the stronger sour notes of Summer. Then it was on to the Frite Galois, which offered the most sour notes of all and was my favorite of the session. Their Raspberry Wheat was also surprisingly good, with fruit and sour notes drowning out nearly all the wheat flavor and one of the most lovely shades of pink-lilac to have ever graced a beer glass. At Upright, a young nano-brewery that uses open fermentation, the sour blend I’d had before was long gone, but the Barrel Aged Four was at least as good. After aging for a month or more, the wheat flavors of the original Four were virtually gone, being replaced by wonderfully sour flavors. Their two other “modified” beers, Long Pepper Six and Dry Hop Five, offered up bits of sourness, but nothing to satisfy the pucker seeking sour lover. This is by no means the extent of sour beer I should be able to get my hands on and I can’t wait to see what makes me pucker next.